In all the years of bagua I have watched, never have I seen someone, more or less, publicly begin a discussion about it, let alone teach. It has been a part of the bagua practice I learned 15 years back and Tom Bisio does an excellent job of illustrating and teaching it. Unfortunately you have to subscribe to the site but for those who want to expand their knowledge of the internal Arts, it is one of the best sources and worth every penny. Is that the same as nine palaces? In my line of Gao bagua, while we don't necessarily draw a square on the ground and walk around it, there many stepping drills that include elements of the square and triangle. Last edited by C.J.W. on Thu Jan 31, 2019 3:07 am, edited 1 time in total. You are right C.J.W - thanks - I had forgotten about those clips although the square stepping is a bit wider than my or Bisio's practice. I can't remember if the other clips provide instruction. The instructions that Bisio provides are detailed and diagrammed along with a video demonstrating the walk along with direction change. The video is labeled as 1 so hopefully there will be more to follow. The late Huang Zhicheng briefly shows this in the center of the circle 8:20 mark. I also used this square to start walking on the brick practice. Robert it is not the same nine palace as I know it but it very well might hold as a practice in some schools. Last edited by Bob on Thu Jan 31, 2019 5:01 am, edited 4 times in total. Bob wrote: Robert it is not the same nine palace as I know it but it very well might hold as a practice in some schools. I learned a similar drill from Jason Tsou, this is honestly the first time I've seen the drill done outside the Wutan Baguazhang line. Last edited by Fa Xing on Thu Jan 31, 2019 10:56 am, edited 1 time in total. Bob wrote: You are right C.J.W - thanks - I had forgotten about those clips although the square stepping is a bit wider than my or Bisio's practice. I can't remember if the other clips provide instruction. I suppose this probably has a lot to do with body size and fighting style of the masters who passed down the systems. 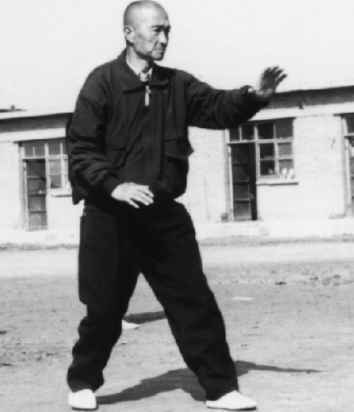 Walking on a small square develops the footwork and body method needed to make quick directional changes and tight evasive movements, which are important attributes for a small guy like Gong Baotien when taking on bigger opponents. Xie Peiqi's line, on the other hand, comes from Men Baozhen, who was 6-foot-4 and powerfully built. So naturally, he would've focused more on larger and more extended movements. For us, our stepping drills contain many 360-degree turns that require three small consecutive steps -- either bai/ko/bai or ko/bai/ko -- to complete. They are essentially the same as stepping on a small square or triangle. Last edited by C.J.W. on Fri Feb 01, 2019 3:15 am, edited 1 time in total.